Tanks, next to supports, are the often the unsung heroes of a match. So when you make one of the bigger plays of the game, even on the main stage of the Overwatch World Cup qualifiers, it’s fine to gloat a little. 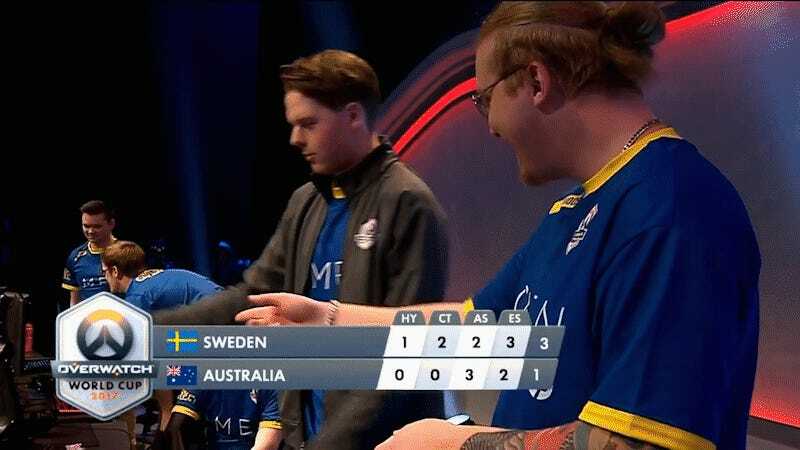 During the last night’s group stage matches in the Sydney qualifiers, Sweden took down the home-crowd Australia team 3-1. At the game’s conclusion, the cameraman caught the eye of Sweden’s Jonathan “Reinforce” Larsson, who used the chance to turn the crowd’s attention to his play of the game on Winston. Larsson’s Winston was a major playmaker for the Swedish squad, who finished the group stage 2-1-0 and qualified for the World Cup over Spain in a 3-0 playoff game later that night. You can see the play in question from the game stream as well, getting a third-person vantage on Larsson’s ultimate that broke up Australia’s offensive. Sweden and Australia are the two to qualify out of the Sydney event, but the action will pick back up again on Aug. 4, when the qualifiers head to Katowice, Poland. If you want to check out the full match between Australia and Sweden, you can do so at the Twitch link here.